Tower Bridge was completed in 1894. 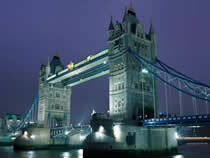 Standing over the River Thames, it has since become one of the most recognisable bridges in the world. At the Tower Bridge Exhibition visitors can explore the workings of this technical marvel of its age, plus enjoy breath-taking views of the sights of London from the walkways. On the tour, you are able to visit the Victorian Engine Rooms, which house the original steam engine used to power the bridge. Then watch the "virtual bridge lift", which shows how the bridge rises to let ships and boats through.